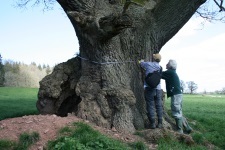 Tree cavities provide very important roost sites for bats and a high proportion of our local bats are dependent on them – from the commoner noctule (in Britain) and Leisler’s bat (in Ireland) right through to our rarer old forest bats, barbastelle and Bechstein’s. Bechstein’s is believed mainly to use rot-holes in the larger boughs high in the canopy, whereas barbastelle appears to be more characteristic of the cavities behind loose bark on ancient and veteran trees. The impacts of the accumulation of bat droppings and urine within the tree have not been studied. Bat guano makes good garden compost so presumably the tree is able to benefit from its degradation within its cavities. The guano probably supports an interesting invertebrate fauna, but this too has not been studied. Mammals other than bats also use tree cavities, particularly squirrels, but also foxes, mink, and anything else seeking dry sheltered conditions for resting, sleeping or even hibernation. 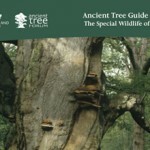 This guide is intended to inspire all those who own or look after ancient and veteran trees, and the valuable and often unseen wildlife they support.